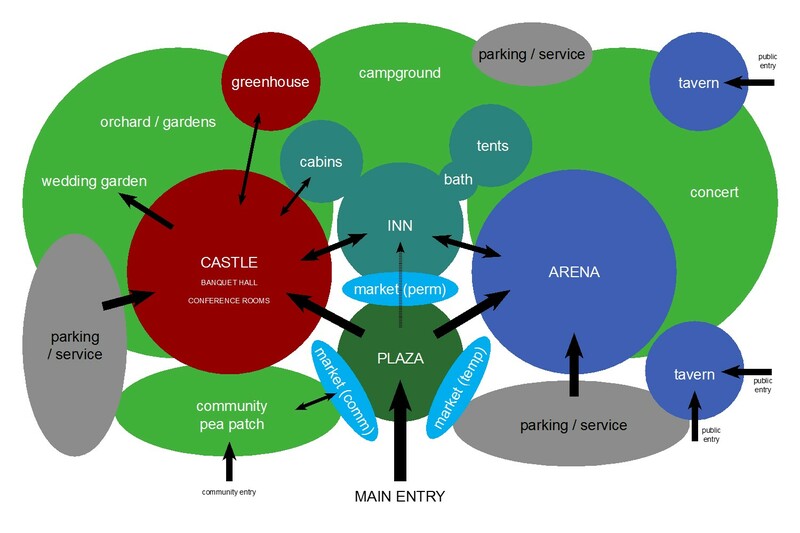 Primary bubble-map diagram of the park modules. Dreamhaven Park is a full-scale venture that will offer a wide variety of attractions and features. We aim to be the luxury destination for gamers, re-enactors, artists and adventurers of all types! Pass through our gated threshold and into a living fantasy village replete everything you’ll need to have an epic time. Stay in a real, fantasy castle! Eat, drink and tabletop to your heart’s desire in our Great Hall. Shop in our handmade marketplace; buy fresh food at the the farmer’s market from community pea-patches and garden lots on-site. Feel like staying the night so you can fully explore? The Village Inn and Yurt Campground (for the more rustic) are the perfect accommodations. You can even kick up your traveling boots at the Tavern, and enjoy a flagon or two after beating up baddies in our live dungeon crawl. Are you an artistan? Craftperson? Hobby gardener? There is a place for you too! Dreamhaven is proud to have a strong local focus by inviting members of the community to establish their place of business in our Handmade Marketplace. Set up shop right in our little hamlet, demonstrate your skills, sell your wares to the public from your own, perfect storefront or stall. Please feel free to navigate through the menu to read about the various modules in our eco-friendly site.